Surrounding Area's - 75 Shekels on all orders. Delivery and setup fee from table on left. Cash, Check, Credit Cards & Credit payments accepted. Please add a 3% convenience fee for credit card payments. Candy Vending Machine - 120 (candy not included but can be requested). 130 with picture. Partying has never had so many options! Don't have room at home or simply don't want the mess and hassle, let us worry about it. Throw your party in a park of your choice or have It's My Party manage the party at your house. We'll handle the whole party worry free. Call us to find out more about our packages & deals and to customize your own package. * Special Party Package for limited time!!! 2 Bounce Houses, Generator, Liquid Bubbles, Parachute, Cup Stilts, Jumping sacs & Choice of Costume!! A full party all for 650 Shekels!!! ﻿Want more than one bouncer or a second or third machine? No problem. Add: ﻿100 Shekels for large Popcorn Machine. Deduct:﻿ 75 Shekels for Happy House Bouncer. ​﻿Add: ﻿100 Shekels for large Popcorn Machine. We require deposits on all rental items, full amount of deposit will be given back when rentals are returned in the condition they were received. Special discounted price on a generator when renting a package. Don't see the package you need? Ask us for a quote on any combination of rentals. 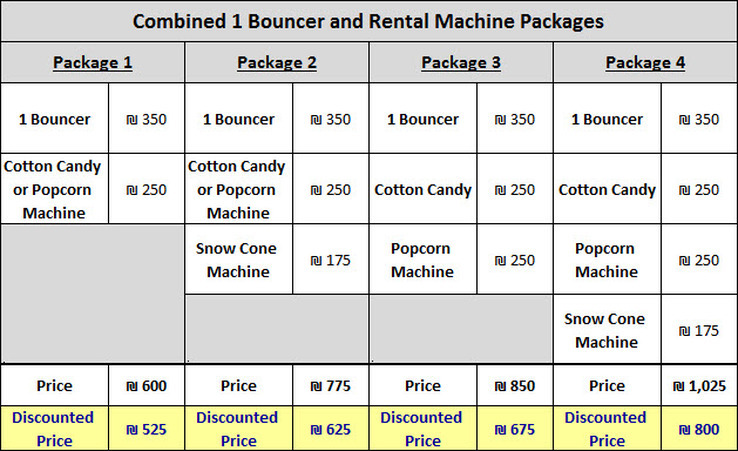 Weekend Rentals are from Friday morning through Sunday morning and are considered 1 day rentals. 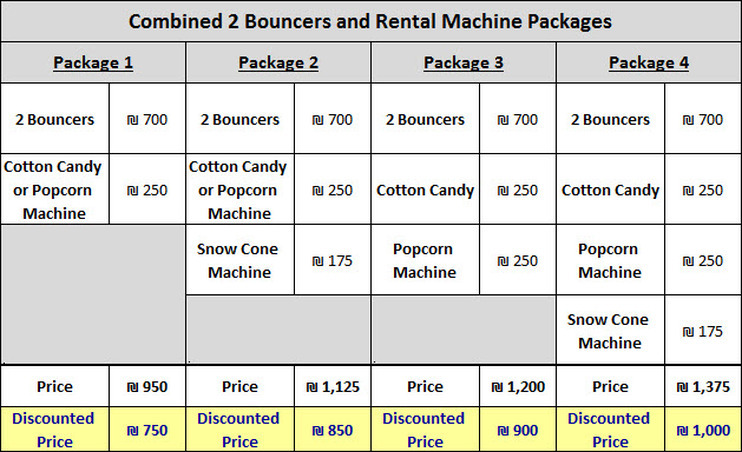 Discounts on 2nd da﻿y rentals. Ask us for a quote and get BIG savings! 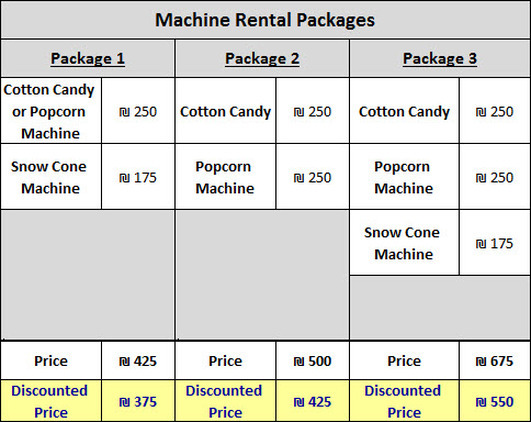 Packages and 2nd day rentals based o﻿n availability. 2nd day rentals can't be passed on to friends. Check out our fun pictures! !